If you want to contact me I'm often on irc.esper.net in #direwolf20, #minecraftforge and many other channels, or you can PM me on IRC or this forum. Requires Forge and Immibis Core. Download page: here. For older versions see the top of this post. Put the downloaded jar file in your mods folder. The mod doesn't require RedPower or BuildCraft, but it's much more useful with them. Also, there's no recipe for the buffer if you have neither of them. This block allows you to transfer items between pipes and tubes easily. It also combines stacks of items together to reduce lag. You can fill it with items with pipes or tubes, or even manually, just like a chest. If you put a wooden pipe, gold pipe, or basic logistics pipe next to the buffer, it will output one stack of items into the pipe every few seconds (depending on the number of empty slots - 5 seconds when empty, 0.5 seconds when full). If you put a filter next to it, with the input side facing the buffer, it will output a redstone signal to pulse the filter at the same rate it sends items into pipes. Set the recipe in the recipe area. Nothing will appear in the output slot, that's normal. Put items into the input area by connecting tubes (or pipes) to any side. Regulators may be useful here. Each side (and the bottom) has its own row of the input area. Place a filter or transposer above the crafting table facing down. Apply a redstone signal to this to extract the crafted item. Another will be crafted almost instantly, if the ingredients are available. If the recipe produces a container item, such as buckets (when water buckets are used in the recipe), they will go to the last, red-shaded row of the input area. They can be extracted from the bottom. Note that if this is full, container items will be destroyed! New feature not shown in the above screenshot: There is a button that toggles between 1 and 64. When it's set to 1 (the default), no items will be crafted unless the output slot is empty. When it's set to 64, items will be crafted until the output slot is full. They can also be rotated with a RP2 screwdriver, Buildcraft-compatible wrench (including Crescent Hammers and OmniWrenches), IC2 wrench or stone hoe. The "C" button (not shown in the screenshot) clears the recipe. The "OD" button (not shown in the screenshot) is for ore-dictionary support. 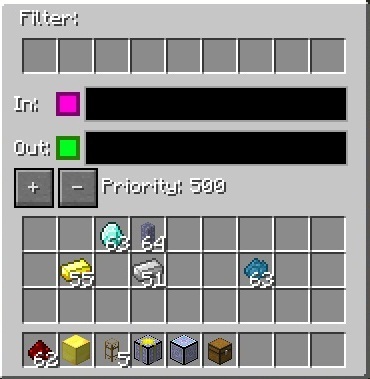 After entering a recipe that uses the ore dictionary - for example, 9 copper ingots - click the OD button, and the ingots will start flashing between all the available types of copper ingots. In this mode you can make copper blocks from any 9 copper ingots, even if they aren't all of the same type. If you edit the recipe it will stop flashing. If you have NEI, you can click the "?" button next to a recipe while the ACT2 GUI is open to select that recipe. It's a chest that holds infinite items. Simple, really. Note that you can't navigate to pages that don't exist. In particular, you can't go to a new blank page unless the previous page is full. Also, when it unloads, it will compact its contents so there are no empty slots until the end. The GUI still has some visual bugs - if you click on a slot that's wrong, it should update with the correct items. Disabled by default due to potential OPness - see the config to enable. Even if not enabled in the config, it can be spawned by /give, creative mode, TMI or NEI. Does not drop its contents when destroyed, to prevent possible lag from having too many dropped items. This is not a bug. Connects to pipes or tubes, and permanently destroys any items that enter it - like a lava pit, but easier to use and with no risk of spontaneous combustion. This acts like a chest that always has a certain item in it. You can pull an infinite amount of this item out of the chest with wooden pipes or transposers/filters/etc, a certain number at a time. There is no way to legitimately get this block, and only ops can place it in SMP, for obvious reasons. Intended for things like admin-built dungeons where you want to never run out of reward items. Right click to open the GUI (again, you must be an op except in singleplayer) and put in the item you want to spawn. 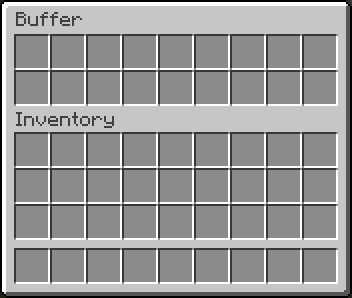 The number of items in the GUI is the maximum number of items that will be spawned at a time (eg with one pulse of a filter). Remember wooden pipes and transposers will still only spawn one item at a time. This block is the "automated retriever robot" that BrickedKeyboard suggested. The side with the bigger hole is the input. It should be touching the output side of a retriever from RedPower. If it's touching any other block, or nothing, it won't do anything. The side with the smaller hole is the output. It should be touching any inventory, such as a chest or ACT2. You can use a filter instead of a retriever, which usually isn't very useful. Make sure your retriever is in "non-slider" mode! The T area should contain the items you want to keep in the output inventory. In this example, it will be kept filled with 63 grass blocks and 63 smoothstone. The R area should contain at least one of each item in the T grid, and should match its layout. If that last sentence was confusing, the picture should show what I mean. The retrievulator will move items between the R grid and the retriever, and apply redstone pulses to the retreiver, to keep the inventory stocked with the specified items. If the inventory already contains the correct items, it will spawn a "retriever jammer", which has no other uses, and place it the retriever to stop it from accepting any more items. Walking over a retriever jammer will destroy it instead of picking it up. Retrievulators can be rotated with either RedPower screwdriver. As of 51.0.0, they can also be rotated with a Buildcraft wrench, IC2 wrench or stone hoe. As of 52.2.0, any BC-compatible wrench will also work, such as TE crescent hammers and OmniWrenches. Note: The T area now (as of 49.2.0) uses fake items, similar to Logistics Pipes. You can set it to request up to 127 of an item, even non-stackable items. Right click to add items, and left click to subtract items. Hold shift to add/remove 10 items at a time. If you click with either button on an empty slot, you will set that slot to a copy of the stack you're holding. Note: If the R grid and the retriever both contain an item in the same square, the retrievulator will not function. If neither contain an item, but the T grid does contain an item in that square, the retrievulator also will not function. When you put a tool in, this will break the block in front of it. It acts like a player breaking a block, so it takes time and uses durability. Liquid versions of the duplicator and incinerator. For the liquid duplicator, you should put a liquid container item in the slot - eg a filled bucket or IC2 cell. 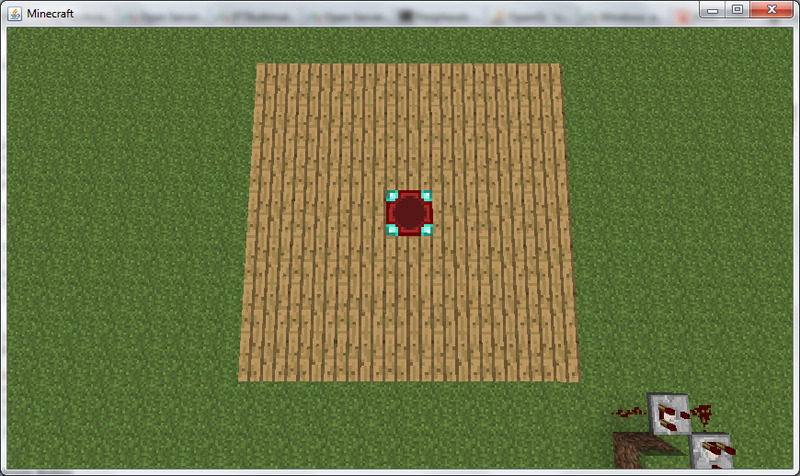 Turns green and emits a redstone signal when the player who placed it is online. Useful for servers which require you to turn off your machines when you're offline. 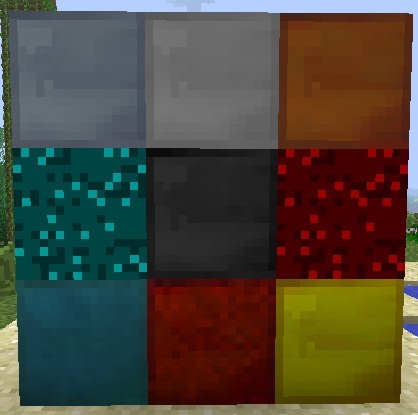 Silver, tin, copper, nikolite, coal, redstone, blue alloy, red alloy, brass. They work like the vanilla metal blocks. 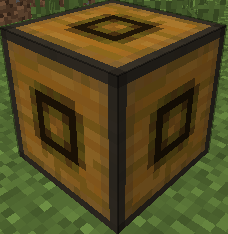 There is also a charcoal storage block that looks identical to the coal one. There is a config option to disable all of these at once, and another option to disable the vanilla storage blocks (coal, charcoal and redstone). Nikolite and redstone blocks must be placed on top of another block or they will fall. As of Minecraft 1.5, redstone blocks are now powered redstone blocks, made by crafting vanilla redstone blocks with sand. 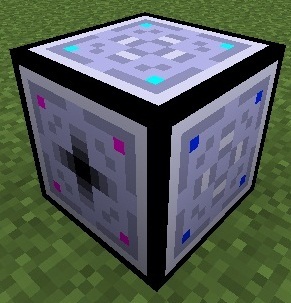 As of Minecraft 1.6, coal blocks are now coal brick blocks, made by crafting vanilla coal blocks with stone bricks. This is a block that loads chunks. There is a limit on the number of chunks each non-op player can load in SMP, and each chunk loader can load an adjustable area. Right clicking opens this GUI. If you are op (or in singleplayer) or the owner of the chunkloader, you can change the size of the loaded area without breaking and replacing it (which would make you the owner). The green button expands the area loaded by this chunkloader by one chunk, and the red button shrinks it by one chunk. As you can see, there is a limit on the number of chunks that each player may force to be loaded. In singleplayer, or if the owner of the chunkloader is an op, there is no limit. Pressing F9 shows loaded chunks, as with the Teleport Tether, however the format of this display is quite different. First, you can see a blue or orange box around all chunk loader blocks, even through walls. This is useful if you bury your chunkloaders and forget where they are, or if somebody tries to cause lag on SMP. Blue boxes indicate chunkloaders you own, while orange boxes indicate chunkloaders owned by someone else. Orange boxes are only visible in singleplayer, to ops, or if they have been enabled in the server config (chunkloader.hideOtherPlayersLoadersInF9=false). For the rest of this section, a "visible chunk" means a chunk that is being kept loaded by a chunk loader you can see with a blue or orange box; if you can't tell a chunk loader is there, you can't tell which chunks it is keeping loaded. Second, a translucent blue border will be drawn around the chunk you are standing in, if it is visible. This border cannot be seen through walls, and helps to see whether your machines are all in the same chunk. Third, a green line will be drawn in each corner of each visible chunk. Fourth, a translucent red square will be drawn above your head height, in each visible chunk. It will be drawn once for each chunk loader - that is, if two or more visible chunk loaders are keeping the same chunk loaded (and thus the chunk is counting multiple times towards your limit) the red square will appear darker. This *is* visible through walls and ceilings, so that you can see it indoors. If you set chunkloader.allowFuelPiping=true in immibis.cfg, then automation mods (such as Buildcraft pipes, RedPower 2 tubes and ComputerCraft turtles) will be allowed to insert fuel into anchors. If it is set to false (which is the default), they will be blocked (using ISidedInventory). The available fuels and value of each fuel is configurable in immibis.cfg. This is mainly intended for server admins. The amount of fuel used is scaled by the number of chunks, so a 3x3 loader will use 9 times as much fuel as a 1x1 loader. All of these commands are only available to operators. Tells you the current and maximum loaded chunks of that player. Sets a quota override for a specific player, equivalent to setting it in the chunkloader.playerQuotaOverride section of immibis.cfg. This does update the config. Sets a fuel item. ID is the item ID, and time is the amount of time. Unit is a multiplier for the time - it can be "sec" (seconds), "min" (minutes), "hr" (hours) or blank (ticks). Same as above, but with a specific metadata/damage value. Enables automatic fuel insertion and updates the config. Disables automatic fuel insertion and updates the config. They mostly work like RedPower 2's microblocks. The mod must be installed in your coremods folder. 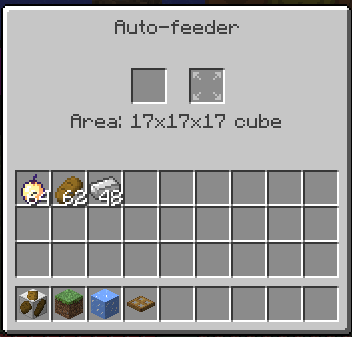 This adds one block, that allows you to automatically feed yourself. Put any food in the left slot and it will feed nearby players that need feeding. Put golden apples (the ones made from gold nuggets) in the right slot to extend the range. Every 4 apples will add another 2x2x2 to the area. The maximum possible area is 49x49x49. This mod provides a way to move items from A to B, by labeling them. This is a teleposer. It has an input side and an output side (both of which can be set in the GUI), and moves items from the input side to the output side. The input side has a black centre, and the output side has a white centre. Notice each side of the block has different coloured lights on it. Each direction corresponds to a colour, to allow you to select them in the GUI. The two coloured squares show the current input and output sides. Left or right click to cycle through the possible sides. Note that you can set them both to the same side. In the picture above, the input is on the purple side and the output is on the green side - this is the default setup. If any items are in the top 9 slots, only those items will be allowed through, like in an RP filter or BC diamond pipe. These are holo-slots, like the diamond pipe (If you don't know what that means, try it and see). Ignore the textboxes and priority for now. This is the simplest useful setup with a teleposer. There is a chest next to the input, and another chest next to the output. 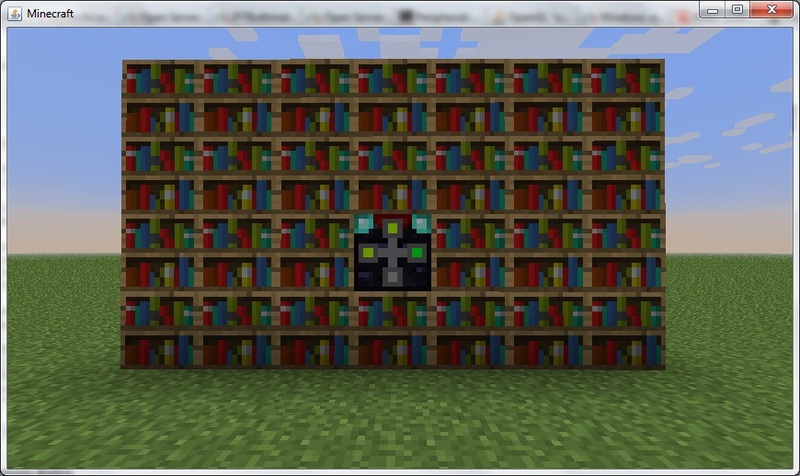 Items will be moved from the input chest to the output chest. The chests could be replaced with machines or other inventories. These are transport conduits. They can be used to move items instantly between different teleposers. They can be covered in microblocks, but the microblocks currently will not affect connections between conduits - they will be purely aesthetic. 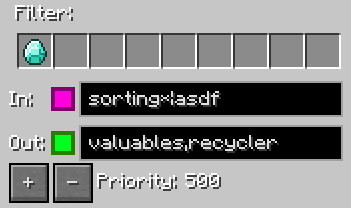 Item stacks travelling through transport conduits have a label, which can be any text string. They will go to the highest-priority connected teleposer with a matching item filter (or no item filter) and a matching label. Remember those textboxes in the GUI? They're for labels. The "out" textbox specifies the label items will get when they leave this teleposer, and the "in" textbox specifies which labels are allowed to enter the teleposer. The "in" text can be a |-separated list of labels to accept, which can include * as a wildcard. The "out" text is a ,-separated list of labels to try sending the item to. the teleposer will accept diamonds which are labelled either "asdf", or anything that starts with "sorting". It will then send them to any teleposer labelled "valuables". If no teleposer can accept the item (perhaps the valuables chest is full) it will send them to "recycler" instead. The last block is the transpressurizer. Teleposer networks require power to run, and the transpressurizer converts electricity into a form the network can use. Connect a transport conduit to the top, and an IC2 cable to any other side, and power will be converted until the network is full. It will accept any voltage. It can also be powered from BC conductive pipes. 1 MJ provides the same amount of power as 2.5 EU. If you don't have IC2 or BC or just don't want to supply power, there is a config option you can use to disable the power requirement of teleposers. Note that power is used every time a teleposer tries to push an item stack onto a network, even if none of the items could find a destination. A network can store quite a bit of power, and there is currently no way to measure stored power on a network. A teleposer uses 3 charge units whenever it attempts to push an item stack, plus one charge unit per item in the stack. If there is not enough stored energy to push the entire stack, it will not do anything, even if there is enough to push part of the stack. 0.8 MJ or 2 EU are required for 1 charge unit. The maximum stored energy in a network is 128 charge units for every connected machine side. This is a dislocator. It acts somewhat like a retriever in RedPower, but it can send items to other places as well. The direction is pretty straightforward - it sets the side of the block that connects to a tube network. Finds an item matching the item set in the dislocator. It only considers chests and machines which are connected to the output sides of directly connected teleposers. It only considers teleposers whose input label matches the "search label" in the GUI. Emits the item from the input side of the teleposer it was found in, labelled with the "eject label" in the GUI. You have a cobblestone chest with an input label of "cobblestone", and a furnace with an input label of "furnace". You want to move 8 cobblestone at a time from the chest to the furnace. 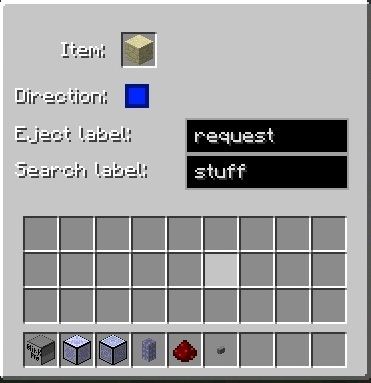 You would set the search label to "cobblestone" and the eject label to "furnace", and put 8 cobblestone in the item slot. You can set multiple search labels, separated by commas. They will be tried in that order, as with teleposers. You can set multiple eject labels, separated by commas. Ditto. The priority used for searching is the opposite of that used by items. If your cobble goes to a chest, then to a recycler if the chest is full, then dislocators will check the recycler first (assuming it meets all the other criteria). It will not look "through" teleposers - if there is a teleposer between the dislocator and the cobblestone chest in the above example, it will not work. It will currently not take items from multiple stacks. If a chest has 27 stacks of 1 cobblestone, a request for 27 cobblestone will fail. Moves some items, as if you applied a redstone signal. the GUI but instead uses the ones passed as parameters. Returns a unique request ID. Sends a dislocator_done event no more than one tick later. parameter is true if the request succeeded, or false if it failed. You can convert teleposers to dislocators and vice versa. Both recipes are shapeless. This is a mod that adds liquid XP, and related machines. You will need a mod capable of transporting liquids, such as Buildcraft, Thermal Expansion or RedPower 2. One bucket of Liquid XP is worth 10 experience points. For comparison, each level is 17 experience points until you reach level 15. 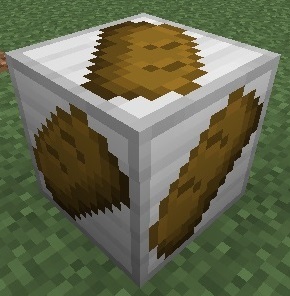 When this block is placed in the world, standing on top of it will cause your XP to be converted to a liquid, stored in its internal buffer, and then emitted to any nearby blocks that can accept it (such as pipes, liquiducts and Buildcraft tanks) automatically - you do not need a wooden pipe or redstone-powered liquiduct. You may notice that you have a small amount of XP left which the Absorber is unable to absorb - this is because you have slightly less than one point of XP left due to rounding errors, as Minecraft keeps track of your XP in an over-complicated way. Use any bucket-filling method (right click on a BC tank with a bucket, or use a TE liquid transposer) to get LXP buckets for crafting the rest of the machines. This is an LXP Collector. 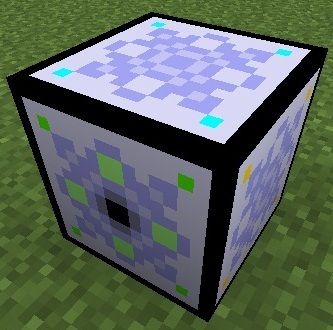 It works like the Absorber, but instead of taking XP from players it collects XP orbs in a 13x13x13 area centred on itself (6 blocks in each direction). This isn't enough to make an automatic XP farm yet, though. As you may be aware, mobs will only drop XP (and rare drops and blaze rods) if they're killed by a player. More accurately, if they die within 3 seconds of being damaged by a player. Well, LXP Corp's got that covered too. This is the LXP Catalyzer. For a relatively small cost of Liquid XP, which can be pumped in any side, it will make nearby mob deaths count as player kills. The cost is one XP point per mob catalyzed. The range is the same as the Collector, and any mob killed within this range will drop XP. If a mob leaves the area it will only drop XP if it dies within the next three seconds. So now that your mob farm produces Liquid XP, what are you going to do with it? Unfortunately for you, we have not discovered a way to turn Liquid XP back into regular XP, however we were able to duplicate some of the functions of regular XP. Update: You can use a Liquid Transposer/other bucket filler to fill glass bottles with Liquid XP, to create Bottles O' Enchanting. This is a blank medallion. It's used as a raw medium for the Imprinter to store levels. They stack to 4 and are reusable. This is the LXP Imprinter. It requires blank medallions as input, and charges them with LXP to a certain level, which can be set in the GUI. Blank medallions can be inserted in the left of the GUI, or piped in from the top. Charged medallions can be extracted from the right of the GUI, or the bottom of the block. LXP can be pumped in to any side. This is the LXP Enchanter. It requires charged medallions (top) and books (left). It does not require LXP. When a charged medallion and a book are both present, it will enchant the book using the levels stored on the medallion, returning an enchanted book (right) and a blank medallion (bottom). There is a config option to allow the Enchanter to enchant things other than books - by default, it cannot. Unlike the vanilla enchantment table, this is capable of storing multiple enchantments in a book. The lower-left slot in the GUI is the "template slot." If this is empty, any enchantments can be stored in the book, as with normal enchanting. Otherwise, you can place any enchantable item here and it will be used to determine the enchantments. For example, if a golden sword is used as a template with level 30 medallions, then the Enchanter will create enchantments as if you are enchanting a gold sword at level 30, but will place the enchantments on the book instead of the sword. The template item takes 4 "uses" of damage for every level used in the enchanting process. In the example above, the gold sword will receive 120 damage points and be consumed with every enchantment, as it only lasts for 33 uses. 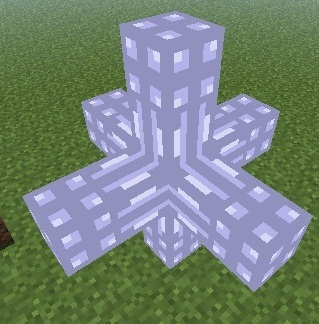 A diamond sword would also receive 120 damage points, but would last for 13 enchanting operations, and would produce less valuable enchantments due to its lower enchantability (as in vanilla). You can insert new template items from the back of the block. If a non-enchantable item is used as a template, the Enchanter will not function. The Enchanter requires bookshelves to be placed around it. As of 54.0.1, the bookshelves can be up to 3 blocks from the Enchanter horizontally, and can be up to 2 blocks above or 1 block below the Enchanter. 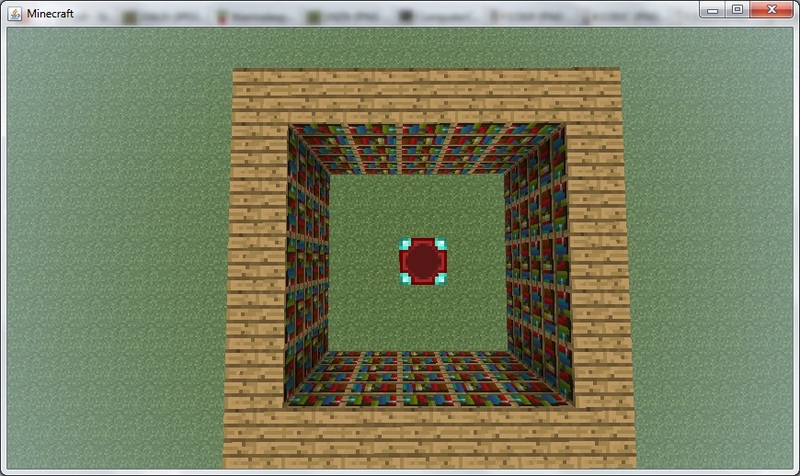 The bookshelves can be up to 1 block below or 1 block above the Enchanter. It does not check for obstructions, so you can place other machinery between the Enchanter and the bookshelves. Due to the Enchanter's decreased cognitive capacity relative to a human, the Enchanter requires many more bookshelves than a manual enchanting table. You need two bookshelves for every level on the medallion. To use medallions up to level 30, you will need 60 bookshelves. Before version 55.1.0, the last machine is the LXP Combiner. This is essentially an LXP-powered anvil. It is capable of performing all the functions of the vanilla anvil besides renaming. It cannot apply enchantments to the "wrong" items - it won't put Protection on a sword or Sharpness on a dirt block. It is not capped at level 40. It does not use the vanilla mechanic where already-repaired items cost more to repair again. This works both ways: items that have been already repaired in an anvil can be used as input with no extra cost, and the resulting item can be repaired in an anvil with no extra cost. Input is from the left and right sides of the block. Output can be extracted from the bottom. Liquid XP can be pumped into any side. There is no LXP machine that can rename items. 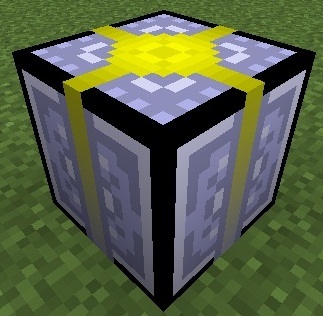 The LXP Isolator, added in version 55.1.0, is a machine that separates enchantments from items. Put an enchanted tool/weapon/armour piece/book in the left, put empty books underneath it, and supply a (relatively) small amount of LXP. For automation, insert items from the top and extract them from the bottom. Insert books from any side. This layout is compatible with hoppers. If the input item has no enchantments, or is damaged, it will be moved directly to the output slot for no cost. 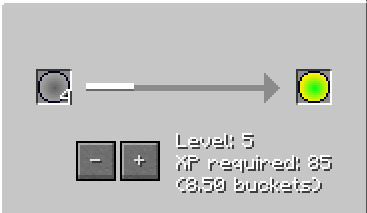 Otherwise, 15 XP points (1.5 buckets) will be consumed, and the first enchantment will be removed from the item and transferred to a book - unless the item was already a book with one enchantment, in which case it is moved directly to the output slot for no cost. GitHub suggested that name, btw. This is a tool that deobfuscates mod downloads without decompiling them, so you can test your mod's interactions with other mods in MCP/Eclipse without reobfuscating. Seems to load RP2 and IC2 without problems. Available in source code from GitHub, or download the jar from Dropbox. There's barely any documentation, so if you need help, PM me here or ask me on IRC. I had the old license here for versions prior to 48.2.0, but then I accidentally deleted it while rearranging this post. So now I'm letting you do whatever you want with them. Decompile them, change my name to your own, upload them somewhere else, and make millions of dollars off them, if you want. And no, you don't have to ask me to make a port or a modpack. The license says you need to include it in "all copies or substantial portions of the software"; since there's a copy in the download that's already done for you. Suggested by Markie on IRC. It lets you pick up arrows fired by skeletons, the same way you can pick up arrows you fired. The license from the top of this post doesn't apply here, because it's 99.9% Mojang's code. Just put the class in your jar file (and delete META-INF for the client). You don't need the client mod in SMP. Should work with Forge, but does not require it. This makes creepers just disappear instead of exploding, so your terrain is safe (because vanilla isn't like Bukkit, they don't hurt players either). Suggested by Olaf464 on IRC for his server. Officially discontinued as of 26/09/2012. Old versions are still archived at the old download pages (see top of post). Yet another very unimaginatively-named mod. This one will keep all chunks with at least one tile entity loaded, ignoring chests, signs, end portals, mob spawners and record players. It's just for my learning about IChunkLoadHandler, but I thought someone might find it useful as a compromise between keeping the entire map loaded (as some servers do) and the default chunk loading behaviour. This mod adds recipes to EE for transmuting items using the Philosopher's Stone. Note that it does not use the learning system like the transmutation tablet does. Don't bother trying to use these recipes in normal crafting tables - they're much more useful for automatic ones. It reads the item and block IDs from mod_EE.props and does not interact with EE in any other way. If you find any missing recipes or there's no way to transmute X to Y with just the pstone, post it here. I expect there to be quite a few items or conversions I've overlooked, given the number of recipes in this mod. I suggest you use CraftGuide to see the list of recipes added. Requires EE2, and nothing else except for EE2's requirements. Put the zip in your mods folder. Again, there are way too many matter transmutations to list them all. Try CraftGuide or NEI. A big thanks for immibis. It doesn't interact with RedPower except through Forge, so even if she doesn't like it, she can't say it's breaking her copyright. Added a new mod - it allows you to pick up skeleton arrows. Suggested by Markie in #computercraft and I thought I might as well make it since it's very simple. Nice work! I bet it will take me a while to figure out the full potential of this mod but the buffer already is part of my auto-smelting system and the crafting table works nicely with Philosopher's stones and the likes. I did notice a small bug.. the recipe of the crafting table MK2 is missing the wooden pipes, making it even easier to craft :happy.gif:. Don't be in a hurry to fix that one :wink.gif:. Edit: Curse y u no merge my posts? Edit 2: Updated to 1.0.2, fixes the bug where the config won't be generated properly if there's an ID conflict. While using the 1.0.0 version of tubestuff I ran into the missing texture bug.. so I upgraded to 1.0.2. Then I found out I had to change the block id because of a conflict. When I did that the textures seemed fine but I was missing a recipe for both blocks. I restarted the game and the textures went white again. Missing textures: I've never seen that. Are you using a texture pack or any mod that changes rendering? Missing recipes: Which recipes were missing? If it comes alphabetically before RedPower or BuildCraft, it won't think they're installed when it adds the recipes. Block ID conflict: That's odd, because if you didn't have a conflict in 1.0.0 you shouldn't in 1.0.2 either. It might be a bug with auto-assign... if that keeps being a problem, I'll turn it off by default. Thanks for doing the arrow tweak. I've been waiting for someone to do this for 1.1. 1- I'm using optifine, but keep in mind that none of my other many mods have this problem. It seems random too because tweaking the item id sometimes shows the proper textures and sometimes not. This is probably low priority unless it's something obvious. 2-I'm missing both IC and BC recipes where both worked fine in 1.0.0. Renaming the zip to Redpower-immibis-core-and-tubestuff-client.zip or zz-immibis-core-and-tubestuff-client.zip does nothing. Swapping item id's around does nothing. Downgrading to 1.0.0 fixes my problem. 3-I'm guessing the config file also worked properly for the 1.0.0 version because I'm not using 1.0.0 without a problem (apart from textures). It has both auto-assigns disabled and block-id set to my own preference which works as intended. 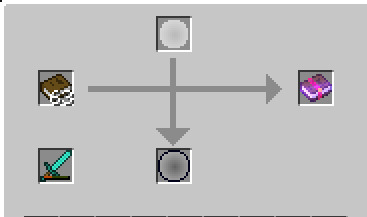 1- I haven't reproduced either that or the other problem (wrong textures), but I did find that if you change the meta values of blocks in the config (without changing the block IDs) then existing blocks still work but have the wrong textures. What IDs are you using? 2- Turns out I derped 1.0.2, and didn't call the function that registers the recipes (because they were added in the same place the blocks were registered, and I had to move that around for a bugfix). Should be fixed in 1.0.3, which is compiling now. Nah, he's stayed out of my code with this one, so I'm fine with it. Actually looks kinda useful. 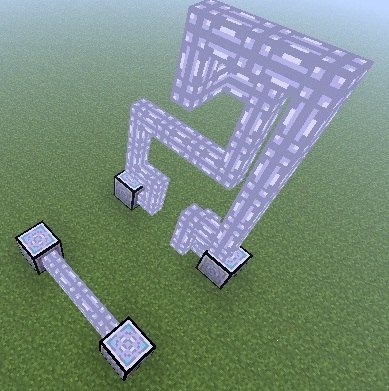 I thought the buffer's operation (with the pulsing redstone) was rather clever, actually. 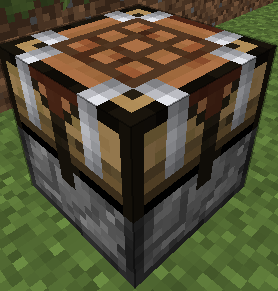 And a fully standalone automated crafting table is sure to appeal to a lot of people. Since it has got Eloraam's blessing, and I've been looking for a good way to turn pipes to tubes and so forth without dropping items through the air into waiting obsidian pipes or transposers, I may give this a go. Only thing I wish it had was bidirectional tube-pipe conversion, but I'm guessing that will have to wait until Eloraam opens up the tube code with her planned API. I can't get the server to work... I set the item IDS in the config to 134, but when I try to spawn them in-game I get "there's no item with id 134". Just realised when I fixed the recipes in 1.0.3 I forgot to fix the server as well. Sorry about that, I'm still kinda new to modding. 1.0.4 is uploaded. Could you make the Buffer timer faster? It outputs one stack each 5 seconds here. That's intended - the stack combining feature wouldn't be useful if it was too fast. If you need it to move more items than that then don't worry - it will speed up the fuller it is (up to 0.5 seconds with no empty slots). If you need it to be fast for some other reason, say so and I'll think of something. The OP was outdated and said one stack every second, and I've changed that now - thanks for pointing it out. Added another mod that adds some Philosopher's Stone transmutation recipes for EE. I'm going to bed soon, so if there are any problems with that I probably won't seem them until tomorrow. Yes, just a typo. Fixed. Note: I do not run my minecraft in the default folder, but start it in an alternative folder (so I can have multiple versions at the same time). Can you see the blocks in TMI or NEI? Did you did just make this without Elo's (and x3n0) permission again? Decompiling it is fine with me, I think I even said so in my license in the OP. It gets the machineID and logicID by reading redpower/redpower.cfg, so can you upload that somewhere (preferably something like mediafire; not a pastebin) and post the link?